4/C, also known as 701 Fourth Avenue and 4th & Columbia, is a proposed supertall skyscraper in Seattle, Washington. If built, the 1,029-foot-tall (314 m), 93-story mixed-use tower will be the tallest in Seattle, surpassing the neighboring Columbia Center. It would also be the Pacific Northwest's first supertall building, with a height of over 1,000 feet. It is being developed by Miami-based Crescent Heights and designed by LMN Architects, with a total of 1.2 million square feet (110,000 m2) in gross leasable area split between 1,200 apartments, 150 hotel rooms, office space and retail. Crescent Heights bought the half-block property, which was home to two parking garages owned by the Costacos family, for $48.75 million in September 2015. The project was announced during the same month, standing 1,111 feet (339 m) tall with 102 stories. 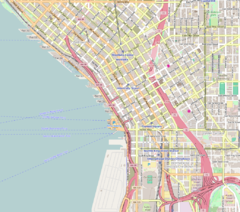 Concerns over the proposal affecting traffic from nearby Boeing Field and Seattle–Tacoma International Airport prompted the Federal Aviation Administration (FAA) to review the project, similar to concerns shared with the nearby Columbia Center when it was built in the 1980s. On January 4, 2016, the FAA sent a "notice of presumed hazard" to Crescent Heights regarding the 102-story building and recommended reducing the height to 965 feet (294 m), slightly shorter than the Columbia Center, for a favorable determination. The FAA was also concerned that the tower crane required for the skyscraper's construction would interfere with helicopter operations at nearby Harborview Medical Center, resulting in a temporary closure of the hospital's helipad. The proposal was downsized from 101 to 100 stories in February 2016, reducing the amount of residential units by 100 rooms and removing half of the proposed hotel rooms. Ahead of a design review meeting in early March, Crescent Heights scaled back its plans further, proposing a 1,029-foot (314 m) skyscraper with only 93 stories to comply with the FAA's request. The adjusted height would make the building taller than the nearby Columbia Center and the U.S. Bank Tower in Los Angeles, but fall short of the Wilshire Grand Center in Los Angeles and the Salesforce Tower in San Francisco. Crescent Heights also submitted an alternative 959-foot (292 m) proposal for design review, which would fall short of the Columbia Center. The tower would feature a four-floor above ground parking garage using a car elevator rather than traditional ramps. The garage would also be built for future conversion to housing and office space, using level floor plates and pre-built components for electrical and climate control equipment. ^ a b "4/C". CTBUH Skyscraper Center. ^ Stiles, Marc (September 25, 2015). "First peek: With added floor, new Seattle skyscraper will be 'approximately 102 stories'". Puget Sound Business Journal. Retrieved September 25, 2015. ^ Bhatt, Sanjay (November 16, 2015). "Seattle about to enter elite skyscraper club". The Seattle Times. Retrieved November 18, 2015. ^ Bhatt, Sanjay (September 22, 2015). "101-story skyscraper on Seattle's Fourth Avenue proposed". The Seattle Times. Retrieved September 24, 2015. ^ Stiles, Marc (August 26, 2015). "Miami developer plans huge, new skyscraper in downtown Seattle". Puget Sound Business Journal. Retrieved September 24, 2015. ^ "Miami firm pays $49M for half-block on Fourth". Seattle Daily Journal of Commerce. September 22, 2015. Retrieved September 29, 2015. ^ "Crescent Heights: 4/C tower will be 1,111 feet". Seattle Daily Journal of Commerce. September 24, 2015. Retrieved September 24, 2015. ^ Stiles, Marc (September 24, 2015). "Proposed 101-story Seattle skyscraper is so tall the FAA is reviewing the plan". Puget Sound Business Journal. Retrieved September 24, 2015. ^ Stiles, Marc (January 4, 2016). "FAA says proposed 102-story tower is too tall". Puget Sound Business Journal. Retrieved January 4, 2016. ^ DeMay, Daniel (January 4, 2016). "Proposed 102-story tower would be too tall for FAA approval". Seattle Post-Intelligencer. Retrieved January 4, 2016. ^ Markovich, Matt (January 4, 2016). "Proposed 101-story Seattle skyscraper hits FAA snag". KOMO-TV. Retrieved January 4, 2016. ^ Stiles, Marc (February 17, 2016). "Downsized: Seattle's mega skyscraper now has only 100 floors". Puget Sound Business Journal. Retrieved February 17, 2016. ^ a b "Crescent Heights shows new images for a shorter 4/C tower on 4th Ave". Seattle Daily Journal of Commerce. February 24, 2016. Retrieved February 24, 2016. ^ Pacheco, Antonio (June 21, 2016). "Seattle, San Francisco, and Los Angeles vie for tallest tower west of the Mississippi". The Architect's Newspaper. Retrieved August 24, 2016. ^ Marshall, Aarian (November 2, 2016). "It's Time to Think About Living in Parking Garages". Wired. Retrieved November 11, 2016.